I talk a lot about peer mentoring and my network in some of my other ACRLog posts (see “Don’t Underestimate Your Peers” in my tips for LIS students post). The last few months of being a new librarian, publishing my first peer-reviewed article, and presenting at conferences—all of which I couldn’t have done without the support of my peers—have convinced me that this topic deserves its own post. I presented with a few of my closest friends last month at ALISE. Our panel was about three different student-led initiatives and how LIS schools can more systematically involve students in decision-making. When we received questions from the audience, we would sometimes ask each other to answer a specific question because of that person’s unique perspective or experience. We fed off of each other’s energy. I had somehow forgotten how much they always challenge me, both professionally and personally. It was invigorating to hear their answers—answers that provided a critical lens and held that students were qualified stakeholders that deserved a spot at the table. The panel brought me back to the energy that keeps me going as a librarian. Right after the panel, a collaboration I facilitated with a peer, Dylan Burns, went live. The ACRLog team had composed a list of questions for Hack Library School and ACRLog writers to address. We had no idea what the posts would look like and if we’d receive provocative, coherent posts from the prompts we created. Almost everyone that wrote for the collaboration was one of my peers and—full disclosure—several of the people posting were my friends. I was awed by the quality of every post. This collaboration pushed me to question my work/life balance, how I treated (and continue to treat) accepting my current job as the “finish line,” and the complexity of my professional identity. Most importantly, the posts made me really consider how much I try to create space for others on this blog and in other places that I have privilege and opportunity. One post in particular made me question how we reward (and, often, condemn) vulnerability and honesty within LIS. The collaboration and the conversation and comments it created took me on a rollercoaster of ups and downs, through joy and even disappointment. But I never stopped thinking. Every post made me think. That’s what my peer mentors do. They make me think. They challenge me. They teach me. And I, in turn, become a better librarian, teacher, friend, and writer through mentoring them. If someone were to ask me what I like most about being a librarian, I don’t think I would say that it’s working with faculty or students. I don’t think that I would even say that it’s that I get to learn something new every day. I love those things about librarianship. But to be brutally honest, it’s the community that keeps me coming back day after day. My accomplishments are my peers’ and vice versa. Every success is something we’ve worked through together, through the literature or Twitter or personal relationships; every failure is something we can debate and contemplate further. 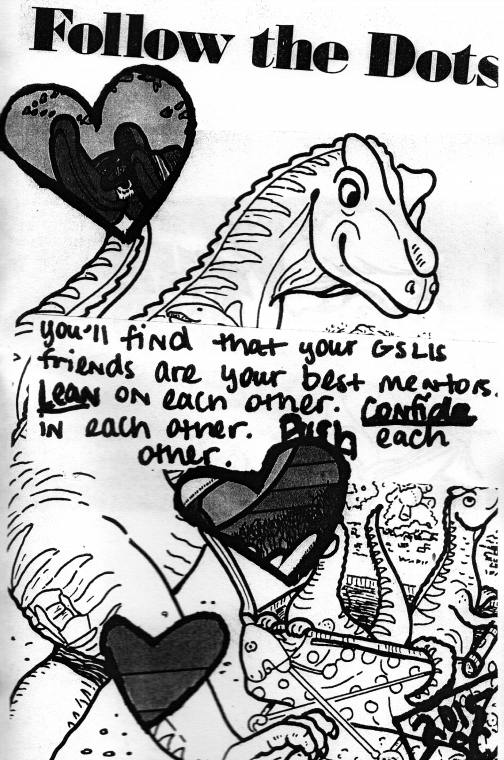 I thought about my peer mentor relationships a lot when I was writing an article for In the Library with the Leadpipe last October. I respected my reviewers so much that I was afraid to send them a very rough first draft of my article. I asked a few of my closest peers to read the draft and give me feedback. Some of their feedback was harsh but every piece of it was helpful. All of their notes and suggestions helped me restructure the article, find my unique voice, and make my argument more coherent. I sent a revised first draft to reviewers and one of them, an expert in critical open education whom I deeply admire, said “I am grateful that this was written and that it will be published, and I am honored to have been asked to be a small part of it!” I don’t say this to boast about myself or my writing. The draft that she read would have never existed if my peers hadn’t read a much less refined version of it and still seen enough potential to suggest improvements. Moreover, I would have never even submitted an idea to Leadpipe if I didn’t have the encouragement and support of my peers. That comment is as much theirs as it is mine. When we honestly ask ourselves which person in our lives means the most to us, we often find that is those who, instead of giving advice, solutions, or cures, have chosen rather to share our pain and touch our wounds with a warm and tender hand. This is what peer mentoring looks like, especially in times of transition. My first year of librarianship has consisted of my peer mentors mostly listening and empathizing. It is a lot more complex than coming up with a list of suggestions. Now, I have found a few like-minded peers. Thank goodness. I mean, I’d be nuts already without them. But, is there more to library administration than a handful of friends that I trust? Again, where is the community? A recent “Inside Higher Education” post on Why Mentor Matches Fail calls for faculty to move away from a guru-mentor model to a network-mentor model, which is very similar to what I describe above. The guru-mentor model relies on chemistry and the mentor having enough free time to advise the mentee (para 6). The network-mentor model recognizes that there common needs that all new faculty have: “professional development, emotional support, intellectual community, role models, safe space, accountability for what really matters, sponsorship, access to opportunities, and substantive feedback” (para 11) and that these needs should be met through a variety of mentors and a “network of support” (para 12). This echoes Michelle’s point: where does one find a variety of mentors and colleagues? I also wonder, when does a relationship go beyond a trusted friendship to a peer mentorship? Are they the same? What does true “community” look like? The first answer that comes to my mind is Twitter. Some of the mentors I have access to through Twitter are “gurus,” but many are peers. Not everyone has access to the peer mentor network that I’ve built. I had the great privilege of attending an active LIS school in-person and having a graduate assistantship that encouraged peer to peer learning at the reference desk and through project work. So the question becomes, how can we use new means to build networks or make our current “network-mentor model” more rich? How can we continue to actively invite others into our network in a meaningful way, particularly when we know that they need access? I don’t have all of the answers. I’d like to leave you with something that I do know, though. My favorite line of the “Inside Higher Education” piece is: “Let’s face it: mentoring is time-intensive, invisible and unrewarded labor” (para 7). My friend Elizabeth Lieutenant also tweeted about this recently. Peer mentoring is often hurling an unbelievable amount of emotional, uncompensated, invisible labor into the abyss, all while hoping that you’re helping your colleague as much as they’ve helped you. But it is, truly, the most rewarding, fulfilling, and engaging thing that I do. Thank you to my many peer mentors who inspired this post and who continue to invest in me. Check out our post on HLS today too! Sveta Stoytcheva, ACRLog Guest FYAL blogger, reflects on how the academy shapes work/life balance in “Reflections on Work/Life Balance and Academic Librarianship.” See more information about the HLS/ ACRLog collaboration here. Victoria Henry holds a Bachelors of Arts in History and a Bachelors of Music in Flute Performance from Hope College. She is entering her final semester of library school at the University of Illinois at Urbana-Champaign. She hopes to find a job in an academic library working with undergraduate student researchers and technology. While not in the library, Victoria enjoys spending time with her fiancé, playing her flute, and reading for fun. Victoria was asked to write about who her most valuable mentor has been and why. As I’m entering my final semester of library school, I am finding myself reflecting on what the future holds and what has brought me to this point in my career. While many different professors, teachers, mentors, bosses, supervisors, and family have led me to begin library school, there is one particular person that stands above the rest as having guided, affirmed, and taught me along my journey to library school and career pursuit as a librarian. As a history and flute performance major undergraduate student at a small liberal arts college, I knew that I enjoyed learning and researching, but found myself struggling to determine and discern the career path these very different interests would lead me. Should I be a professor or museum curator? These were just some of the many options that crossed my mind as I began to consider life beyond undergraduate education. It wasn’t until I talked to one of my history professors that I began to even consider library school. I remember that when my professor first mentioned library school as a possible career path and I chortled and told him that I was not an English major, so that clearly was not an option. However, after he explained that librarians are not always English majors and explained why he thought my interdisciplinary and research interests would fit well into an academic librarian profession, I was sold. He directed me to our campus library to sit down with a librarian and find out more about the profession. After an initial introduction to a faculty research and instruction librarian, I was eventually given a position as a student research help desk assistant to explore the profession and determine if this was a career I should pursue. Within my first couple days on the job, I met one of the other research librarians that has had an incredible lasting impact on my current professional endeavors. My undergraduate library’s research help desk was set up as a tag-team effort. Faculty librarians sat at the desk next to a student worker and trained and guided them through the research interview process throughout their time working there. While many student employees were not interested in a career in libraries, the conversations I had turned into important questions about pursuing a career as a librarian, applying for school, open access, technology, collection development, reference, ACRL standards (and later the Framework), and other important question relevant to librarians. Over the two years I worked there, this librarian became an incredibly important teacher, an asset, but most of all, a friend. She guided me through the application process for library school, helped me determine which school to go to, and provided guidance, support, and encouragement. When I began working at the help desk, she guided me through answering student questions, showing me the databases and how to conduct good reference interviews. As I learned more and more, this hands on assistance turned into small pointers and/or praise when a research question went well. Her approach taught me about providing good research services to student researchers—skills that continue to serve me well in my graduate assistantship position. Furthermore, she took an interest in caring about my well-being as a student and always took the time to ask how I was doing—even when we were not working together. Even now, as I am entering my final semester of library school, she continues to be a mentor and friend that supports me and is guiding me through the next portion of my career pursuits. As I reflect back on this experience and look forward to a career in libraries, I am inspired to make the same difference and provide the same support for an upcoming librarian. I know without the love, support, friendship, and guidance of my undergraduate librarian and her willingness to answer and talk about libraries, I would not be pursuing a career as a library in the same manner that I am today. It seems to me that the interconnectedness of our work makes us library folk frequent collaborators. It often takes a number of people working together, for example, to select, acquire, receive, catalog, and provide access to resources. Or, for instance, how does a librarian have access to students for in-class instruction if not through collaboration with faculty? We are often skilled at working cooperatively and fostering partnerships within our libraries, across our campuses, and beyond. The characteristics and quality of our many collaborations, however, can sometimes be disappointing–as is the case in all work environments, no doubt. It’s frustrating when work that is connected and should be collaborative is instead disjointed and siloed. It’s challenging to work with a difficult or defensive colleague or supervisor. And it’s depressing to recognize when we ourselves have been the source of a problem. I’ve spent a lot of time over the past year and a half or so working with a faculty member at my institution on a fairly intensive teaching and research project. The course of our deepening and developing partnership has provided me an occasion to give a lot of thought to our collaboration and, by extension, the nature of collaboration more generally. This particular faculty member has been an especially generous collaborator. By generous, I don’t mean she has been nice or easy to work with, although she certainly has been those things. What stands out most to me is that she has never been territorial or defensive. She has had no tendency toward one-upsmanship. Instead, she has been at ease with and even eager for sharing ideas, work, and credit. She was as keen to hear my ideas as she was to share her own and just as likely to advance my interests as she was hers or, better yet, find common ground between them. Indeed, when I reflect on the many people I’ve worked with, I feel grateful for all the generosity I can so easily call to mind. These people and moments were characterized by, much like my recent faculty partner, a ready willingness to share ideas, information, communication, and credit, an inclination to recognize the potential and the contributions of others. These were people who were accountable and took responsibility for their fair share of both work and mistakes. Rather than trying to stake personal claims, they sought to support and advance those around them such that everyone benefitted–individually and together. As far back as elementary school, I’ve prided myself on being a good teammate or colleague, yet I now recognize how one-sided a collaborator I often have been. I cringe to recall the moments when I was certainly eager to help others, but not work with them. I see now how I was often resistant to others’ contributions and reluctant to hear criticisms. I was more than happy to give, but not to actually join forces. I wasn’t ill-intentioned, just perhaps (too) focused on self-reliance or proving myself. A search for recommendations on how to be more generous at work turns up articles like this one and this one. The short version of their suggestions includes things like: be thoughtful, work hard, communicate readily, collaborate better, share credit, create positive working environments, and so on. While these things can be easy to know, they are often hard to do. To be clear, I’m not talking about being nice here. I’m by no means against niceness or kindness. What I’m talking about, though, is developing and contributing to an environment of thick collegiality such that we can work effectively together in a “shared endeavor to create something rich in meaning.” Generosity, I think, helps makes this possible. So how to become a more generous collaborator, leader, colleague, supervisor, supervisee, mentor, and/or teacher? Some research suggests that, perhaps like most things, practicing makes it easier. And my personal experience suggests the same. The more I practice generosity–that is, the more I cultivate the mindset and habits of a generous colleague or leader–the easier it is. And the more generosity I see around me and receive in return. It seems to me that respect and trust are at the core of this attitude and practice. Being generous both requires and helps promote trust and respect. I’m not trying to pat myself on the back here. I do think I’m better at this than I used to be, perhaps because of time, age, worldview, and because I’ve worked at it, too. I also know I can be better at it still. But the practice of promoting generous behaviors and attitude–the work of it and the reflection on it–has had a significant impact on my work relationships, quality, engagement, and satisfaction. It would be naive to ignore the roles gender and other types of power and privilege, or lack thereof, can play in collaborative work and the work environment generally. Some might say, for example, that generosity is expected of women, and not men. Or some might say that to be “generous” actually means to be weak or timid or taken advantage of. There are challenging and troublesome expectations and stereotypes wrapped up in this conversation for sure. It’s reasonable to worry how this might reinforce divides, rather than challenge them. It seems to me, though, that generosity can help to subvert stereotyped expectations and structural inequalities by acknowledging others’ capabilities and accomplishments, by making space for voices otherwise unrecognized. I think practicing generosity at work opens communication, creates respect, and transforms our perspectives and practices for the better. Generosity can promote opportunities and engagement for us all.